This goes without saying, but people love posting pictures of their cats online. They love it so much, in fact, that they're often willing to forego little things like "privacy" and "self-respect" in favor of bringing their furry friends to the widest possible audience. A new data-driven project throws the gratuity of all this feline-flaunting into sharp relief, and gives an important lesson about digital privacy in the process. It's called "I Know Where Your Cat Lives." 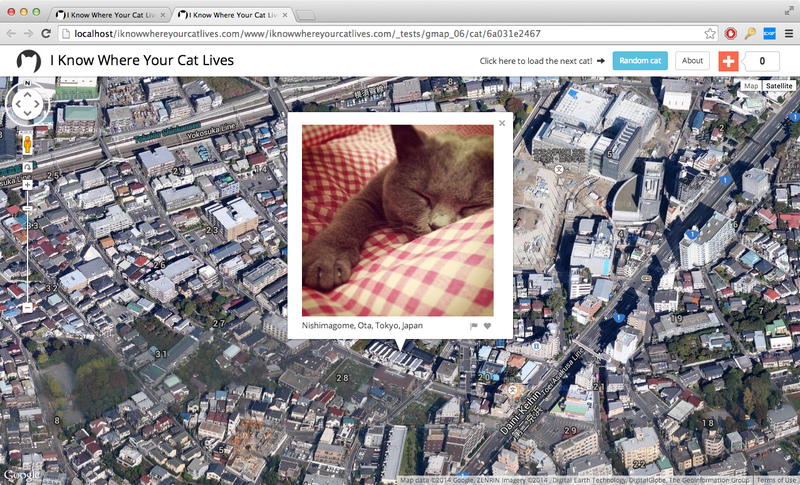 As the name suggests, it's an interactive map that lets you pinpoint the exact location of one million cats—or, at least, the cat's location when they were photographed and had their likeness uploaded for all to see online. As the name also suggests, the findings are more than a little disconcerting. Because if you take the cats out of the picture here (heretical as that may seem), you're left with something fairly Orwellian. The million-strong cat-map was made by Owen Mundy, an artist and programmer who teaches at Florida State University. In a description of the project on his blog, Mundy says that he found all the cats featured on the site by sifting through publicly available data that he could pull from social networks and photo-sharing sites simply by searching for the word "cat." He then compiled these results and ran them through "a supercomputer at Florida State University in order to represent the enormity of the data source." These findings only accounts for cat photos that people bothered to tag as such, mind you. But even then, Mundy says he got more than 15 million hits. Thousands more are being uploaded every day as well. As a result, Mundy scaled back his original ambitions to only account for one million. Even with smaller sample size, the results here are staggering and fairly creepy. Being able to hone in on the exact latitudinal and longitudinal coordinates for a given cat seems silly at first. But Mundy reminds us that "I Know Where Your Cat Lives" doesn't actually document all living cats, but "only the ones that allow you to track where their owners have been." So the next time you open up Instagram to post pictures of Mr. Fluffykins, remember: you could also be inviting the entire internet to geolocate you and your cat. And Mr. Fluffykins doesn't want that, now does he? Mundy is also running a modest Kickstarter campaign to spruce up the "I Know Where Your Cat Lives" website.